Home » Uncategorized » What Happened to G-AESY? On August 15, 1939, British Airways Ltd. Lockheed 14, serial number G-AESY, took off from London, stopped in Hamburg, and was bound for Copenhagen. In addition to the pilot, there was an odd, if not mysterious, group of passengers on board: a German corporate lawyer, an English Member of Parliament, two employees of Standard Oil of New Jersey, and an additional crewmember whose employer, much less his duties, remains a mystery to this day. The flight never reached its destination. 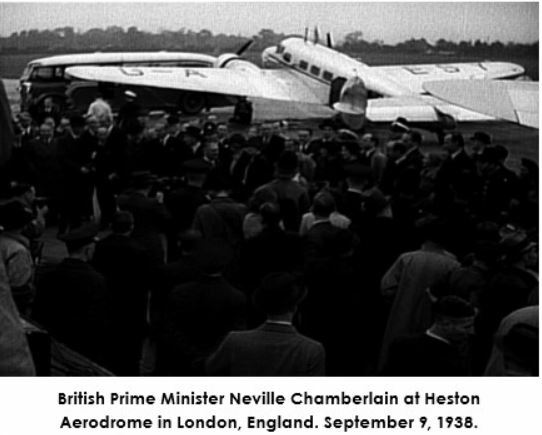 G-AESY in London surrounded by a crowd, approximately a year before the fatal flight. Instead something went terribly wrong enroute, when a fire raged out of control in the cabin and the aircraft crashed into icy waters below a bridge that connects the Danish cities of Vordingborg and Falster/Nykobing. Only the pilot survived. Seventeen days later, Hitler invaded Poland and World War II began. Subsequently, the bridge went on to earn the nickname “bridge of deaths” because it was a key navigation check point for allied aircraft on their way to bomb Germany and also a favorite deployment site for German antiaircraft guns. The demise of G-AESY, raised a variety of disturbing questions for accident investigators e.g., were the passengers listed on the manifest really who they said they were? Were they travelling as a group, perhaps for a meeting, clandestine or otherwise, or was their meeting accidental? How did the cabin fire start? Was it accidental or an act of sabotage? If the latter, by whom and for what purpose? 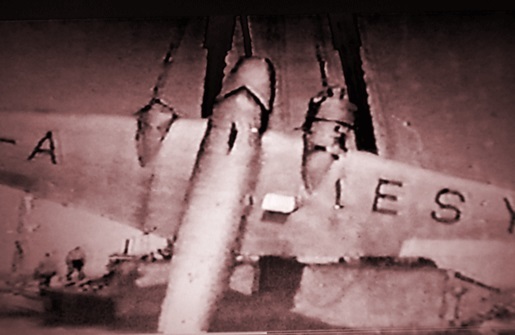 Given that a British aircraft built in the U.S. crashed in Denmark under circumstances inviting the attention of civil aviation, law enforcement, and military authorities; it is not surprising that the investigators, all working under the cloud of war and government secrecy, made little progress toward finding the answers to these questions. 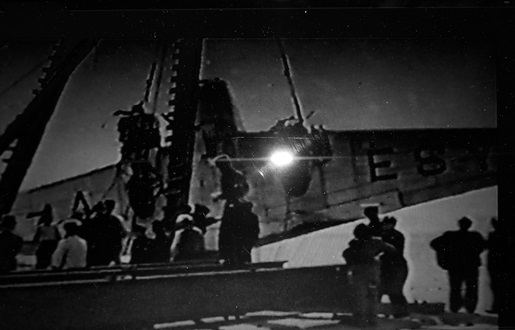 Once the aircraft was located , Danish and British authorities, plus representatives from Lockheed Aircraft , set to work to raise the aircraft from the water. 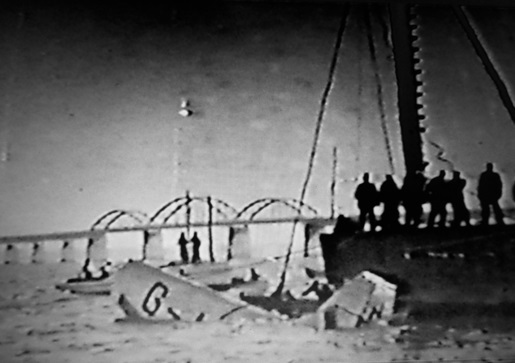 After the crash, local divers worked through the night to search for survivors and remove the bodies of the passengers. The passenger cabin’s interior, along with autopsies of the passengers provided a wealth of clues about what happened before the aircraft crashed. These were studied in depth, but the agencies involved could never agree on a final report. The crash of G-AESY remains a mystery to this day. But one person continues to ask about G-AESY even to this day: M.C.V a.k.a. 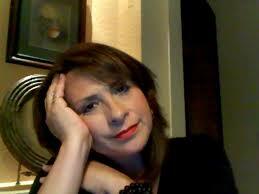 “Catalina” Egan, author of “The Bridge of Deaths.” Why such an unrelenting pursuit of the truth? Quite simply, it was a family thing. 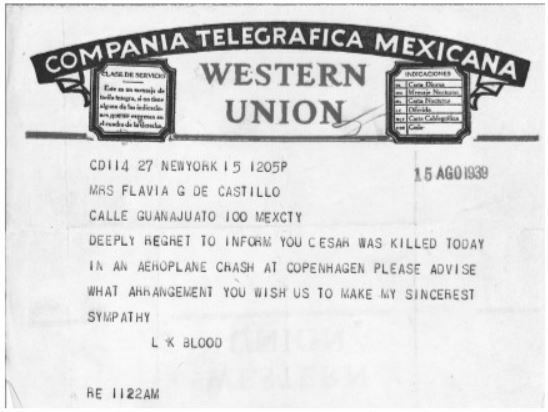 You see, one of the Standard Oil passengers, Cesar Agustin Castillo, was her Grandfather. 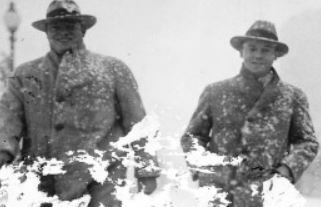 The author’s late grandfather on the left walking with a friend and fellow Standard Oil New Jersey executive. The latter eventually married the author’s grandmother. News sent to the family about the death of the author’s family was cryptic and unhelpful. It took the author nearly twenty years of research, mostly before internet research was readily available, and multiple visits to Denmark, London, and other locations relative to the book; before fashioning a plausible theory about what happened aboard G-AESY. “The Bridge of Deaths” is her story; a story so rich in well written descriptions and anecdotes plus pictures; that mental images of the many interesting people she encountered along the way literally fly into the minds of the readers. The author is still hot pursuit of the truth, and she is getting closer. Was her grandfather a spy? “The Bridge of Deaths” is not a work of fiction; nor is it a historical novel, autobiography, or a research paper on steroids. If not, then in which category does it fit? The answer is all the above! By managing to adroitly tell her story through the eyes of three principle characters: the author, a man who is very real but she has never met, and a fictional character, a bright sassy fictional young woman who adds spice to the story line; and by adding a handful of reputable psyches plus experts in hypnotic regression and other paranormal activities to the story line, she managed to write a fascinating, eminently readable book that avoids being stored in one of the above-mentioned dusty, literary pigeon holes. Quite a feat! Please note my comment above: “before fashioning a plausible theory about what happened aboard G-AESY.” The final truth is almost within Catalina Egan’s grasp, but she is not quite there. This is actually good news for her readers because she told me that next year, reams of classified information concerning its accident is due to be released by the various governments involved and if so, more than likely the whole truth will finally be known. She also promised that when that happens, she will write a sequel to “The Bridge of Deaths”. I can’t wait to read it, but readers should read this book now, so you will be prepared for the sequel. By the way, the Bridge of Deaths is very Kindle friendly. If you feel like reading it right now, click on the icon below. Go ahead, and enjoy! I really like the way you have broken this down. It clearly explains the book, the background, and the author. I’m so impressed with this author’s own story and am reading the book now. Good post. The review was an experiment of sorts, and you obviously ” get it”. The idea was to use pictures and text to engage the reader in a way that he or she learns about the book, develops a relation of some kind with the author, and not last but not least be compelled to read the book. Furthermore, if I am lucky the reader will not notice that he or she is reading the book review. Your comment was the most encouraging and much appreciated.